I've always loved to fix-up my nails. When I was little and wasn't allowed to do anything beauty, one thing I always wanted to do was grow my nails and use nail hardener on them to see them shine. But I got a good spanking every time my Mum saw that shine on them. I've never had log, slim fingers so naturally my nails aren't anything fantastic. Working with The Nail Studio however has given me a change of mind especially with my introduction to acrylic nails and stick-on nails. Well, my nails are having a well deserved rest from all those falsies but that doesn't mean that the whole world is giving their fingers a rest too. The Beauty Africa Conference and Exhibition 2015 is a couple of days away and nail lovers can have something to look forward to this time around as Nectar Beauty Hub has great plans for them. 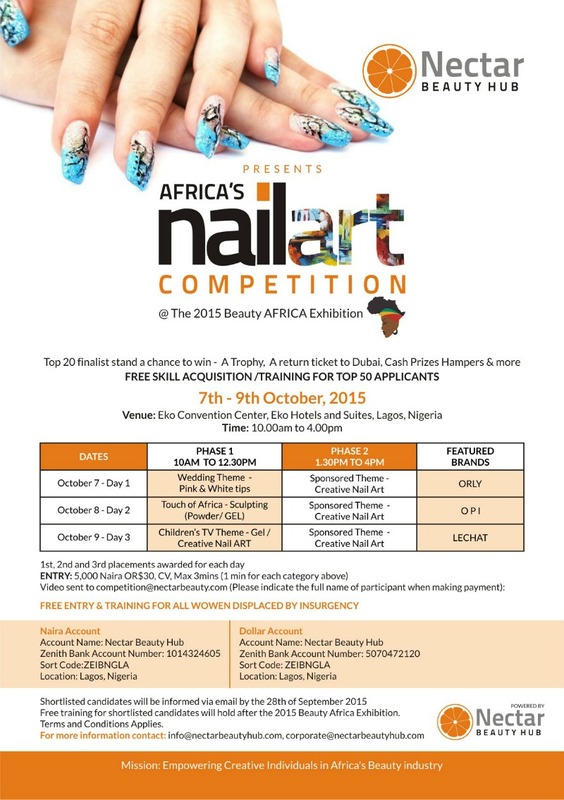 Sooooooo, they are sponsoring Africa's First Nail Art Competition which will be taking place at Beauty Africa this year. They'll also be empowering technicians who've had no access to formal training or accreditation of any sort. They get to compete for jaw dropping prizes including professional training and a trip to Dubai! There is also going to be a Free Skill Acquisition / Training for the Top 50 Applicants. Free training for shortlisted candidates will hold after the 2015 Beauty Africa Exhibition. What do you think guys? Are you going to register? Why I Need A GoPro....I GOT THE GOPRO!